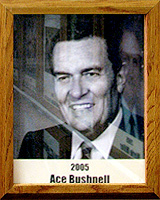 A native of Springfield, Ohio, “Ace” came to Tucson in 1948 and went to work as a reporter for the Tucson Citizen newspaper, primarily covering Amphi H.S. sports, coincidentally, he focused on future PCSHF members and brothers Bobby and Larry Hart and Coach George Genung. When Bushnell became a fulltime Sports Editor in 1950-51, he had a trice-weekly column in which he wrote about such Hall of Famer’s as: Mo Udall, Ed Updegraff; Bill Cheesbourg; Roger McCluskey, Johnny Gibson, and many others. In future writing stints with the Citizen, he continued writing about more recent sports figures such as Mike Candrea, Roy Drachman and Jerry Kindall. As a free-lance writer, he has also written about Linda Carter; Rip DePascal; Dean Metz; Brian Jeffries; and Dr. Mary Roby. Ace has coached Little League Baseball teams and participated in numerous Bowling leagues. He has contributed to the local sports scene for more than half a century. One memorable moment was in 1951 when U of A’s basketball team invited him to its first national tournament, the N.I.T. in New York. Not only was it his first time on an airplane, the tournament was started by his father who was a Commissioner for the Eastern College Athletic Conference. Besides writing about Hall of Famer’s Ace has served on its Board as well as past Selection Committees. He is also active in the community. He has been the Community Relations Manager for the Pima County Sheriff’s Department since March 1983; former FBI agent and has been very active in the area of drug and alcohol recovery with numerous organizations. In 2000 the Tucson Chamber of Commerce presented him its Founders Award.